When they're not criticizing Gabby Douglas's hair or wondering why all North Koreans look alike, the folks watching the Olympic Games are just innocuously rooting for their home team, right? Wrong: There's more racism afoot! 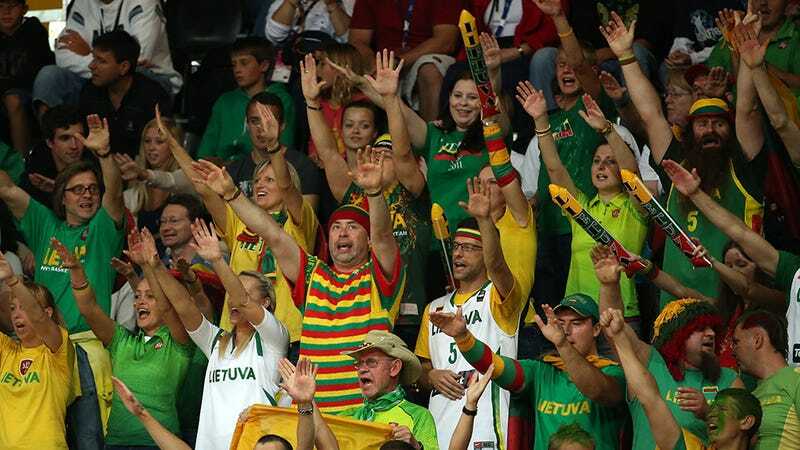 This time, the perpetrators were Lithuanian fans at a basketball game between Lithuania and Nigeria. As Similoluwa Ojurongbe reports for The Grio, a crowd of fans in Lithuanian gear were making monkey chants during the game. Monkey chants. At a global event ostensibly representing peace between nations. A Scotland Yard spokesman says that one man was arrested on "suspicion of a racially aggravated public-order offense." This is not the first time during this year's Olympics that Lithuanian fans have been in trouble. Earlier this week, one of the basketball fans goaded African-American basketball players with the Nazi salute and another made the same gesture towards black stewards. Meanwhile, right here in the US, right after Gabby Douglas won her gold medal, NBC aired a commercial featuring a monkey doing gymnastics. Bad timing, a horrible coincidence, but a lot of people noticed.